Happy Easter! Do you know the history and traditions of this holiday? Easter is a holiday celebrating the resurrection of Jesus Christ. For Christians, the day is of religious significance. For non-Christians, Easter can be a celebration of the beginning of Spring, and there are several traditions that go along with the church services that occur during Easter. Easter Egg Hunt is a tradition that is found in many countries in the world such as USA, Germany, Sweden, Brazil, India, and Philippines. Parents usually hide eggs and other candies outdoors for their children to find. It is a fun way to bring the neighborhood together during the Easter holiday. The Easter Bunny is known to deliver sweets to young children, so the Easter egg basket often contains a chocolate bunny. The bunny originated in a folktale in which the rabbits came to America with the German immigrants. Since then, the bunny has become a symbol of Easter in Western culture. People usually have a big feast with their families on Easter as part of their celebration. One famous dish is baked ham, potatoes, and vegetables. Another famous dish is hot cross buns. 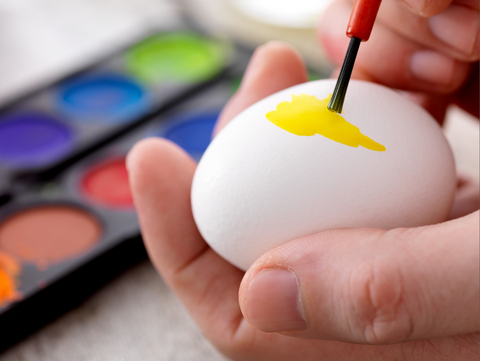 Another fun activity during Easter is to paint eggs! This is a tradition that originated in Eastern Europe, and has carried through to become a popular Easter activity along with the egg hunt. For Christians, Easter is a very important holiday. This importance is marked by a special sunrise service on Easter Sunday that is observed by many churches. In the USA, the sunrise service is usually held outdoors, and is followed by the regular church services.